We knew it was a necessary step… so we decided to dive in. This past year at TCFL, the entire school staff made it their goal to help students become independent, self-motivated learners who take charge of their own education. We focused our professional development on the techniques found in Leaders of Their Own Learning, by Ron Berger, Leah Rugen, and Libby Woodfin, and things went smoothly at first. In the first trimester, we looked at learning targets: how to write them in student-friendly language, how to unpack them, and how to use them consistently in the classroom to help students know what they were expected to learn. During the second trimester, we focused on ongoing assessment and how to check for understanding. Both trimesters went well, and we saw great results in the classroom. In the last trimester, however, we hit a glitch. We had planned to move on to giving effective feedback, but in our weekly observations of teachers — and through discussions in our Friday PD sessions — we realized that many teachers simply weren’t ready to move on. To make things difficult, others definitely were. In the meantime, we had been experimenting with EdcampPD, and through that experience, we realized just how much teachers wanted to be in charge of their own learning, choosing when to learn and what to learn. (Surprise, surprise!) This is what we were working on with our students, because we knew it was powerful. Why wouldn’t it be equally powerful for teachers? We have a strong philosophy in our school and we knew that we couldn’t just have a learning free-for-all, since that freedom can be overwhelming. We decided that we needed to provide the framework, then allow teachers to set their own learning path. We wanted to break those down into smaller targets, and it was tempting to just produce a list of objectives we thought teachers should meet. But we realized that if we wanted buy-in, they had to develop those targets for themselves. So, in one of our Friday workshops, we brainstormed smaller learning targets with the teachers — and they came up with far more than we would have. The brainstorming session was valuable because it also served as a great discussion of exactly what a teacher should be doing to meet each learning target. 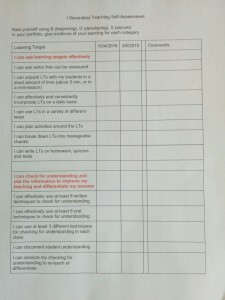 From that session, we put together a self-evaluation form in which teachers were asked to grade themselves as B (beginning), D (developing), or S (secure) on each of the targets. Once the teachers had evaluated themselves, we asked them to choose two areas that they’d like to focus on. Using that information, we began to create courses for each of the targets they wanted to meet. 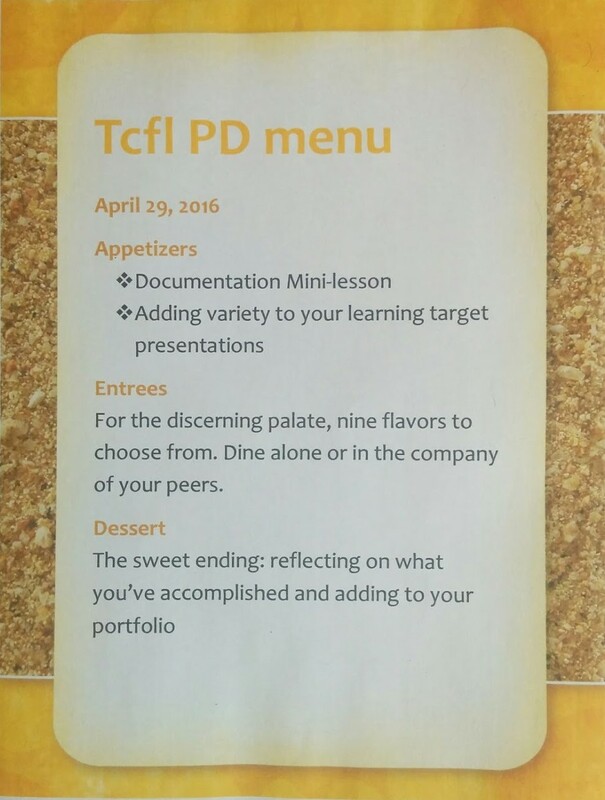 We put the material for the courses on Google Classroom, but we also put the info on a wall, with a menu for that day’s professional development. We wanted to empower our teachers allowing them to share their strengths and be in charge of the PD. So each Friday, we started our meeting with an “appetizer” – a mini-lesson presented by one of our teachers – after which everyone could choose a course to work on (alone or in a group). Alternatively, they could also work on documenting their learning in a portfolio. We had often heard from teachers that they often felt rushed and didn’t have time to reflect on their learning during professional development. 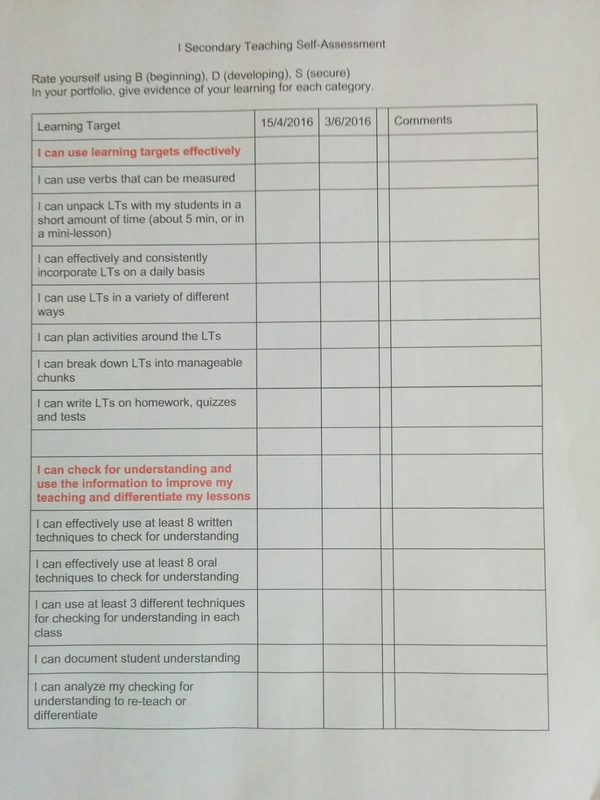 To facilitate reflection, we asked teachers to provide documentation for their secure targets. Teachers were free to choose their own format for portfolios (digital or paper), using whatever they felt most comfortable with. Why use portfolios? Building their portfolios provides teachers with time to look back on their teaching and see the progress they’ve made. Portfolios also serve as a great form of self-assessment: When gathering documentation for a certain target, teachers would sometimes ask coordinators or other teachers, “Hmmm, can you look at this? I don’t think I’m actually secure in this target. What do you think?” They could then set goals to help themselves improve in that area. Our final goal is to have our students create portfolios for their own assessment. As teachers create portfolios, they gain firsthand knowledge of what students will face in this task. They’ll be aware of the hurdles students will have to overcome and the time frame they’ll need, thanks to actual experience with the format. More than anything else, teachers loved the fact that they now had a space for connecting with other teachers from different grade levels and subject areas. Almost instantly, cross-curricular projects were being developed and teachers were learning from each other. After a while, teachers who had mastered all of our pre-developed skill goals were able to decide what they’d like to work on. For example, one secondary school Social Studies teacher is now working on a book study on How’s it Going? by Carl Anderson, and he observed teachers in the Language Arts department in order to improve his conferencing skills. Another teacher is exploring the flipped classroom model. As we continue to observe teachers and meet with them to discuss areas they’d like to improve in, we can help them set goals and make sure that the Friday PD sessions specifically meet their needs. We started our individualized professional development experiment with the secondary teachers in our school, and it was such a success that we’ll be joining forces with elementary this coming year so that the entire school works together. There is so much that teachers of upper and lower grades can learn from each other, but they need built-in time to share their ideas. Actually, the possibilities are endless! We’ve suddenly found that the we now have the freedom and space to truly learn together in any way that suits us at the moment. It’s a win-win situation. Nifty structures, Carla. I’m a fan of such loose-tight tapdancing — the way TCFL structures goals more tightly, yet loosely affords learners countless paths to pursue them. Thanks for sharing. Thanks Brian! It’s definitely a work in progress and we’re always learning. But, like anything in education, it’s a continuum that we move along, never reaching perfection. I think that constant challenge is why I love my job! Love this move towards individualized PD. Our district is attempting to do something similar in concept, as all sites and teachers are so different. I am interested in hearing more about your Google Classroom Courses. Is this something that you and/or a team created? Is there a post speaking to this creation and implementation? P.S. So happy I met you at ASCD last year? Are you planning on attending this year in Anaheim? I would love to meet up! So good to hear from you! We created our own Google Classroom courses based on teacher needs and the skills we’re looking for. The setup was quite a bit of work, but after that we’re free to meet with teacher groups and conference during PD. Most of our teachers like it and we find it so much more effective. There are still many things to tweak and we have to produce more courses, but for the first time in many years I feel that we’re truly meeting teacher needs. Don’t know yet if we’ll be in Anaheim…but I’ve been wanting to go to a conference on the west coast, so there’s a good chance. Let’s stay in touch! Carla, I just love the ideas in this post. It seems like PD on differentiation and student choice/voice is rarely differentiated to meet the needs of the teachers. 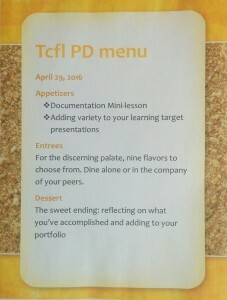 I love the way you’ve structured your weekly PD for your teachers. I’m inspired to revamp my conference and training sessions to match this menu model. Yes, give it a try Mari. Now that we’re doing this we keep wondering why it took us so long to come to this decision! What an enormous undertaking. Thank you for sharing your journey and how your model evolved from sit and get to something that is far more individualized, engaging, and reflective. Would love to hear about your adventures adding elementary to the mix! Thank you for sharing Carla! I will definitely use this as a model for professional learning in my district and recommend to others. Thanks for reading and commenting Bonnie. We’re still tweaking it – every time we see a weakness, we try to make changes to improve the model. I’d love to hear what works for you and how you improve on it.